Simple LDB for Garrison windows toggle. This can be usefull if you're not using the original map. Leftclick opens the selected Garrison Landing Page. Update is pending. I've rewritten large parts of the click function. Tested with 0,1,2,3 garrisons available. Hope it fixes your problems. Ouch, thats strange. I'll take a deeper look. But I dont touch anchoring in my addon. I would guess the gamefunctions I call make this happen. That will take a little to check. Last edited by zemo : 01-27-19 at 09:40 AM. Hi, use shift + leftclick to switch to the correct garrison and the error is gone. 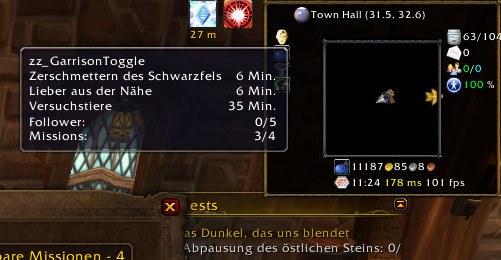 I'll take a look to not cause this error when a not available garrison is selected. Thank you for your report, I had not yet noticed this. Edit: Update available. It should only try to open available garrisons. Not much testing done. Last edited by Rilgamon : 01-20-19 at 10:21 AM. (*temporary) = "attempt to get length of local 'items' (a nil value)"
Hm, the update doesn't seem to work for me? It basically doesn't do anything rightnow but also doesn't produce any errors. Yes , I messed it up ... there are two lines in the .toc file that I had in there for testing but should not go live Sorry for that. I'll take a look. Did you update the addon from an older version? With the new version I'd changed the format of the stored informations. Deleting the stored data should fix it. Last edited by kaimox : 01-17-15 at 02:36 PM. Did you update the addon from an older version? Thank you so much for this! It's so handy! Last edited by Rilgamon : 12-07-14 at 12:35 PM.